Have been using for few weeks at work, pleases every day so far and indicates my position regarding superstition beliefs :D Good quality, keeps heat like a charm. Favorite mug for favorite show! Thanks for super cool product, keep it up! Great Travel mug, sturdy and make a great replacement for a generic travel mug that I've had for many years, but was eventually showing wear. 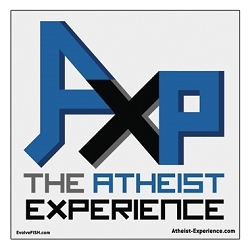 Plus, this new one has a colorful "The Atheist Experience" logo on it.